Really System Issue Six: Smallest Eyry is in this world with us; rejoice! 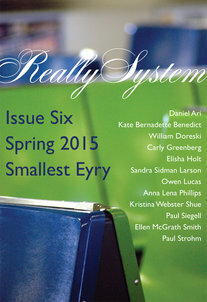 Somehow I forgot to post about the fact that I released the sixth issue of Really System on April 15th, right smack in the middle of National Poetry Month. I’m really pleased with this issue; it has a weird cohesion that I don’t always manage. The issue leads off with three of Anna Lena Phillips Endearment poems, which I cannot stop reading. Go read them now. I described them to her as sounding like broken palindromes, but the more I read them, the seem like perfect palindromes in my memory. I think those pieces are the only anagram-based pieces I’ve published in Really System so far. Also, I love how Paul Siegell & Paul Strohm’s pieces play with our eyes and leave out so much. In other Really System news, all throughout April, former contributors and friends of the journal have been busy working on #RemixReallySystem, providing work that responds to randomly selected piles of words from the issues. These have all been great, and I’m so thrilled that so many people (over 20!) were willing to sink some time into this. 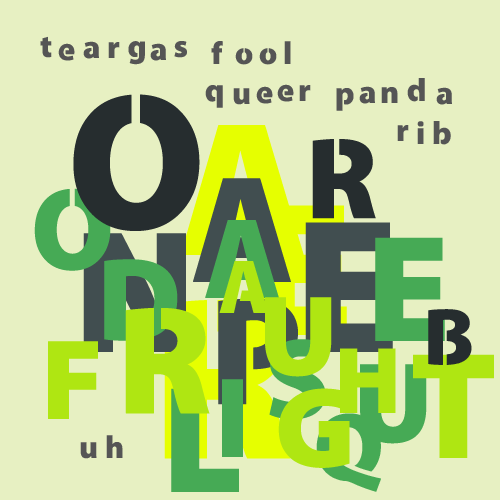 One of Susan L. Lin’s beautiful hand-placed anagram pieces is below; head on over to labs.reallysystem.org for the full slate of projects. Also, submissions are open for Issue Seven, so spread the word.